Arguments in the bench trial of three current and former Chicago police officers accused of trying to cover up details of the Laquan McDonald shooting are over. Now it’s up to a judge to issue her verdict in a ruling that will come later this month. 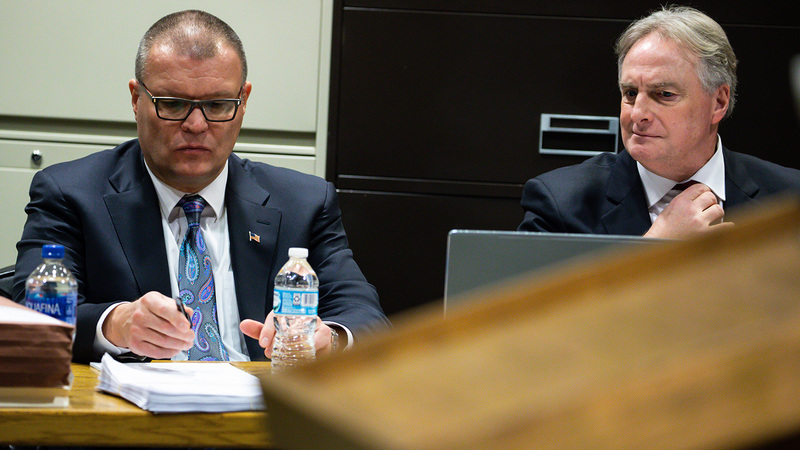 Special prosecutors and three defense attorneys offered closing arguments Thursday afternoon, collectively spending more than three hours laying out their respective cases for the last time before Cook County Associate Judge Domenica Stephenson decides if the officers are innocent or guilty. More: Updates from the courtroom. Chicago Officer Thomas Gaffney, former officer Joseph Walsh and ex-Detective David March are each charged with conspiracy, official misconduct and obstruction of justice, accused of falsifying official reports from the scene of the 2014 shooting in order to “conceal the true facts” of McDonald’s death in an attempt to shield fellow Officer Jason Van Dyke from prosecution. After hearing five days of witness testimony and several hours of arguments, Stephenson said she would take time to review the evidence and issue her verdict on Wednesday, Dec. 19. In extensive closing arguments, attorneys on both side hammered home their key points from the previous four days of trial. Prosecutors say there’s no innocent way to explain away a trio of largely identical police reports from Walsh, Gaffney and Van Dyke that were allegedly crafted to help protect Van Dyke. March lied, prosecutors said, about McDonald lunging at police and falsely said officer statements matched dashcam video of the shooting. “He knew that was false as does any objective viewer of that video,” special prosecutor Patricia Brown Holmes said regarding March. Defense attorneys for the men, however, said there’s no proof of any agreement between the officers to cover for Van Dyke, and chalked up similarities in the reports to possible mistakes rather than proof of a conspiracy. James McKay, who represents March, claimed at least two state witnesses lied to the judge and an eyewitness to the shooting was mistaken about where he was when it occurred. Attorneys for Gaffney and Walsh focused on the “human element” and difficult nature of being a police officer. But assistant special prosecutor Ron Safer said this trial isn’t about the shooting itself, but instead about what happened after. Below, updates from the courtroom. Thomas Breen, who represents Joseph Walsh, in his closing arguments continuously focused on the “human element” involved in the case – that officers were dealing in a stressful situation and may have included “mistakes” in official reports. But those mistakes aren’t criminal, he said, and they certainly aren’t proof of a conspiracy to cover for Van Dyke. Will Fahy, who represents Officer Thomas Gaffney, made similar arguments in his closing, saying his client should have been praised for his actions the night of the shooting instead of being indicted for a possible “mistake” in his report. “It doesn’t make the report writer a criminal,” Fahy said. Defense attorney James McKay, in his closing arguments, says the case isn’t about the public trust, but rather about McDonald’s conduct before the shooting. McKay again claimed his client, March, was nothing more than a reporter on the scene the night McDonald was killed, taking down witness statements and overseeing the investigation. He also again criticized Officer Dora Fontaine, who testified that March fabricated a statement attributed to her. That single statement, McKay said, made up just one line out of more than 100 pages of case reports March drafted and is the only evidence prosecutors have used against him. "She actually had 90,000 reasons to lie, plus some benefits," McKay said, referencing Fontaine’s salary after claiming she perjured herself about the statement in order to save her job. Brown Holmes again ran through the night of Oct. 20, 2014 from the perspectives of all three men. Gaffney, she said, never should have filled out a tactical response report because he never used force against McDonald. And even if he did, she said, his report shouldn’t have said three officers were battered because only two were on the scene at that time. He only did so, Brown Holmes said, to match his narrative with those of Walsh and Van Dyke. Likewise, Walsh and Gaffney both falsely checked a box claiming McDonald had used force likely to cause death or serious bodily harm in order to help justify the shooting. Brown Holmes also said that although March preserved dashcam video of the shooting, he falsely characterized it as matching all officer statements so that no one would watch it. And his report states Van Dyke was “forced” to shoot McDonald in defense of his own life. After defense attorneys for the three defendants rested their cases, Judge Stephenson gave Walsh, March and Gaffney one last chance to testify on their own behalf. But all three waived that right after an admonishment from Stephenson, meaning the trial will conclude without any of the officers taking the stand. Court is in recess for a one-hour lunch break before closing arguments are scheduled to begin. The defense for each of the three defendants rested their cases after just a single witness was called. Nancy Pikarski-Block spent about half an hour testifying Thursday afternoon. She was asked about a report filed by CPD officer Dora Fontaine which indicated that Van Dyke had been “injured by offender,” meaning McDonald, before the shooting. While March was able to print that report days after the shooting, Pikarski-Block testified that March would have been unable to edit or change any information contained within it. Prosecutors also said Pikarski-Block had been subpoenaed to testify during a state investigation into the McDonald shooting, but refused to comply. The attorney representing her at that point was James McKay, who represents March in this case. After her testimony concluded, McKay said the defense introduced dozens of stipulations and exhibits, including March’s investigative files, emails between March and his supervisor and the criminal history of McDonald. James McKay, who represents March, called his first witness: Nancy Pikarski-Block, a retired Chicago police detective who was working in Area Central detectives division on the night of the McDonald shooting. At that time, Pikarski-Block worked in the area’s case management office, where she coded reports and assigned detectives to various investigations. After the shooting, she reviewed a report from Officer Dora Fontaine and input March’s name and contact information as per standard protocol. The defense attempted to prove March neither saw nor reviewed this report from Fontaine, which stated Van Dyke was “injured by offender,” meaning McDonald. Pikarski-Block had objected to her testimony being recorded, but Cook County Associate Judge Domenica Stephenson overruled her, allowing both audio and video recordings.